The first step when lighting your living room is to ask yourself: what happens here? Different activities require different types and levels of light. A well-lit living room will have three different types of lighting: general, task and accent. These are used at different times of day and for different purposes, and key to a functional lighting scheme it to know how and when to mix and use them. 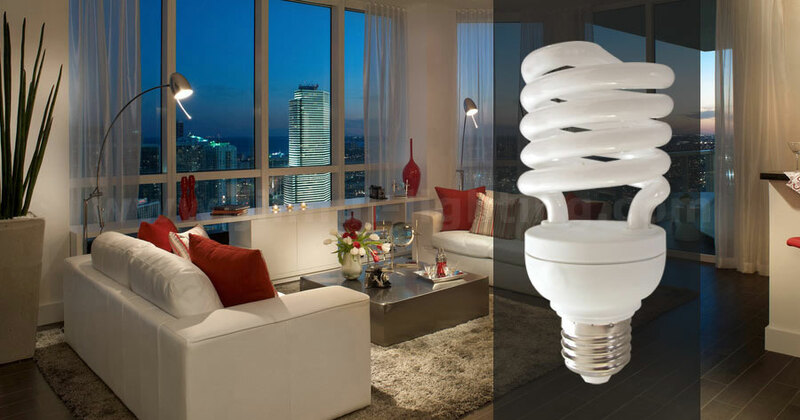 How many energy saving lamps or bulbs do you need for your living room? A good living room lighting scheme uses different kinds of light, set at different levels, that work together to make the space warm, friendly and attractive. Of all the rooms in your home, your living room is where you spend the most time with your family and friends. This room can be made more inviting, comfortable and functional when you choose lighting styles that enhance your personal style. With the various activities that occur here, you want to have a variety of light sources. Standard bulb lighting heightens colour contrast and vibrancy, and is calming, cheerful and natural to the eye. Not all homes have a ceiling fitting in the living room, and if you have lots of natural light during the day, you might not need overhead light at all. But if you have the fitting, a central pendant or chandelier helps to zone the space and create a focus. Similarly, potlights or angled spotlights will create a even layer of overhead lighting. In the absence of any overhead lights, a large, arced floor lamp will do the trick. If you watch TV in the living room, choose the surrounding lights carefully to avoid television glare. It can be distracting to have a bright overhead light above or in front of a TV set, so ensure ceiling lights are dimmable, or use offset wall sconces or floor lamps instead. Take advantage of the newer, more energy-efficient lighting solutions for residential use, suggests Jinhui energy saving lamps. Table Lamps: Bulb, Candle, Mini Global, Mini U Style, Spiral and Column, Mini Flower. Floor Lamps: Bulb, Candle, Global, U Style, Spiral and Column, Circle, Mini Flower. Pendants: Bulb, Candle, Mini Global, Mini U Style, Spiral, Mini Flower.